Read how Louise Fetigan was inspired to launch her charity Little Troopers for children of military parents after noticing how her own daughter was struggling with long periods of separation from her dad. I started out my working life serving in the British Army and saw active service in Kosovo. I really enjoyed being part of the Army but when my daughter was born I realised very quickly how hard it is to have a young family with both parents serving. I left the Army when she was nearly three years’ old but my husband Tony is still serving with the Household Cavalry. When I left the army I went back to night school to study a diploma in marketing and took up a career in project management. In 2011 I started a charity that is very close to my heart in reaction to my own daughter emotionally struggling with her sad frequently being away in Afghanistan. The charity started out life as My Daddy is a Soldier Adventures and the aim was to offer fun events and support to help the children through deployment and long periods of separation from their soldier parent. I used to run the charity part time after work and at the weekends. 18 months ago I took a big leap to run the charity full time and extend our support to all of the British Armed Forces, not just the Army. The charity is now known as Little Troopers. As mentioned I gave birth to our daughter Madison whilst serving in the British Army. Having a young family with two parents serving is very difficult and I made the tough decision to leave. Where did the idea for your charity come from? I started the charity when I noticed my daughter was really struggling, we lived in our own home not in military housing and she was finding long periods of separation concurrently really hard to deal with. I had been a soldier and my husband was still a serving soldier. We had at the time a seven-year daughter, we had encountered Kosovo, Iraq, Cyprus UN tour, Canada and Afghanistan many a time before she was born and since, add onto that countless field exercises and I think we calculated in her seven years her daddy had been away accumulatively over four years of her life. At the time we lived in our own home away from barracks, our daughter went to a predominantly civilian school and the Army had very little involvement in our lives other than it took my husband and her daddy away from home often and for long periods. Madison’s change in behaviours were subconscious to her, she wasn’t aware they were a result of anxiety or worry as they were subtle changes: waking in the night, every night, twice a night (!) and regressing to behaviours of a very small child… not dressing, not wanting to do anything alone, asking where I was going even if I was just leaving the room! I searched and searched but couldn’t find the support I knew she needed, nothing child specific, nothing to distract my daughter from the worry of her daddy being in a war zone, nothing to explain her recent behaviour changes, nothing purely because ‘I am seven and I’m sad because I can’t see or speak to my daddy when I want’. It started with a trek of Snowdon and then My Daddy is a Soldier Adventures was born, a registered charity serving every British Army family. Now we are called Little Troopers and help families from all the British Armed Forces. Children who have a parent or both parents serving in the regular or reserve British Armed Forces. Every year we put together a beautiful calendar showing those special moments between children and their serving parent. The calendar not only raises money for the charity but raises awareness too. It is often featured in national, consumer and regional media. It helps us to reach out to even more families, especially those living in their own home. As a charity we rely entirely on voluntary donations. It is hard when you have a project that you know is desperately needed but haven’t got the funds to implement it. I had the privilege of attending the Sun Military awards and winning the Support to the Armed Forces award. There were so many celebrities and VIPs at the event but seeing the admiration that they had for our charity and the Little Troopers we support was amazing. When the awards were played out on ITV the feedback we got about the support military children got from the charity was overwhelming, it makes it all worth it. It’s important because I believe passionately in what our charity provides, I am still living and breathing the life and can relate to everyone who uses the charity. We are unique and the only tri-service charity that provides support to children. I hear from families every day who are struggling with another long deployment and the support they have found from our charity and the community we bring together has really helped them get through it. All of the Little Troopers that I meet; seeing them smile and laugh at our events and in the photos I receive drives me to keep working on their behalf. How do you balance your charity with your family? This can be a tricky one. I am very lucky that my daughter Madison and husband Tony completely support me and can often be found sitting on the floor in the evening packaging up calendars, separation packs and various other resources that we provide. Madison is now 14 years’ old and growing into a lovely teenage girl who still helps shape some of the projects Little Troopers deliver and my husband is still a serving soldier and constantly packing up and going away from home. It isn’t easy, we move frequently to weird, wonderful and often remote locations but I try to balance things so I am able to be mummy, supportive military wife and also give the charity the attention it needs. If you believe in something passionately, keep going to achieve it – several people and organisations have told me to give up on my charity but thousands of military families thank me for the charities support which drives me to continue. Talk regularly to your audience – the people you support or sell to. Make sure the resources/ product you produce are still relevant. Make your approach personal – make sure your audience knows you care and understand and every email/message is read and responded to. People then believe in your dream and follow you on the journey. 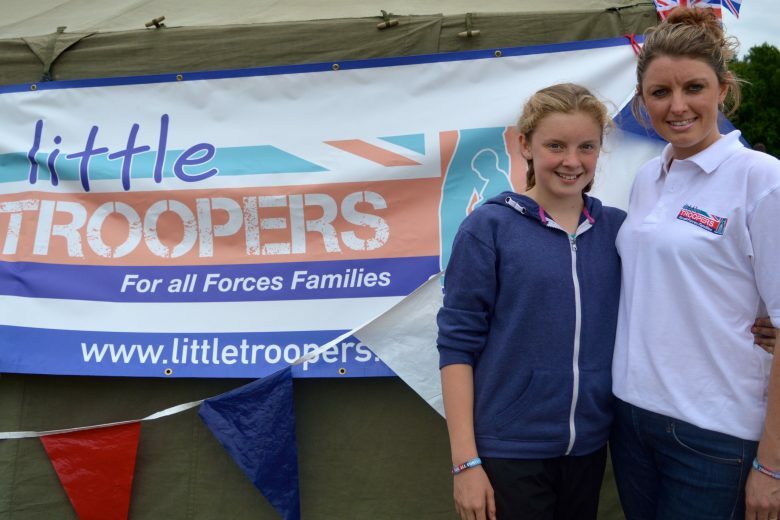 You can find out more about Little Troopers on their website.